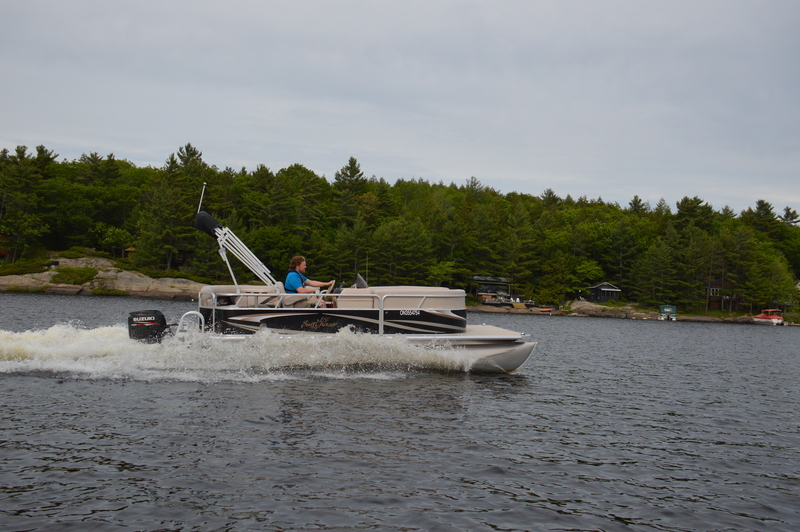 In Boats&Places and for BoatTest.ca we profile all kinds of boats from small little skiffs to big honkin’ cruisers and just about everything in between. Believe it or not, small pontoon boats are some of my favourite assignments. It’s not just because they are a continually successful segment of the new and used boat market, and no, it’s not because they are easier to test than something more complex. It’s because, to me, they are in many ways the best of boating stripped down to the core. The 2012 SunChaser DS 20 is not a showpiece of modern technology, nor does it feature the latest and greatest gadgets (it doesn’t even have a speedometer), but I loved driving it. The roomy bow lounge has dual bench seats with a walk-through gate. While basic, it’s not boring. You’ll also note the speakers built into the seats immediately upon stepping aboard. Storage is not an issue with each cushion lifting up to reveal big compartments. 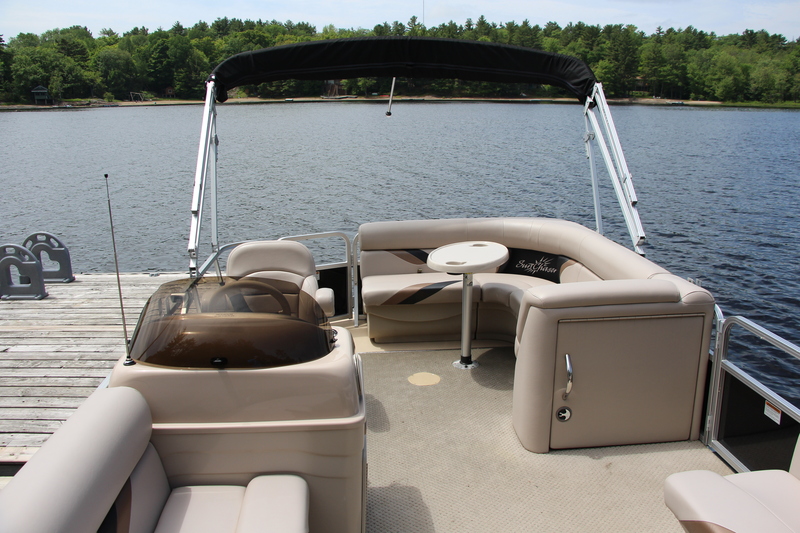 In front is a massive platform to place lounge chairs, use as a casting platform or to swim from. The rear seating around the table has the same storage compartments, meaning easy access to the battery. On the port side is another large gate to give you plenty of accessible docking options, and though it sacrifices seating in that section, this is tremendously handy. Across and built into the helm station, is a big storage hatch, which is great for accessible safety gear. Just above is a watertight storage compartment that can keep your documents secure and dry. 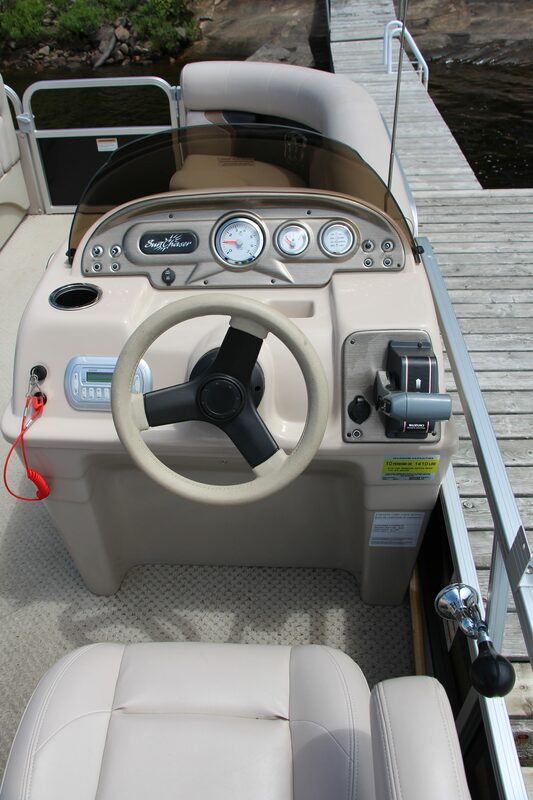 The helm has a standard pontoon layout with small windscreen, cushy bucket seat and a clean, simple layout with tachometer and fuel gauge. 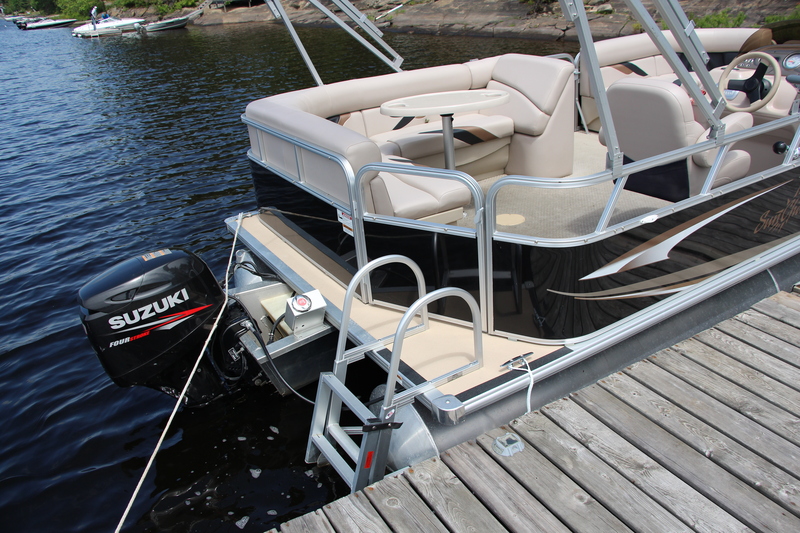 With the bow swim platform there’s no need for anything at the rear but the swim ladder that reaches deep into the water right by the gate. Though rated for a max of 115-horsepower, this SunChaser was outfitted with a much more moderate 40-hp Suzuki, but still, it was fun. Honestly! The two-log set-up does affect handling, but nothing to worry about with a smaller motor. This is a roomy cruiser, not a speed demon. We maxed out at 20-point-7 miles per hour and it took nearly 12 seconds to get there. There’s no blistering top speed, it doesn’t bank in turns like a traditional v-bottom hull, but with this boat and this power you can comfortably let the kids take this out. If you’re just getting into boating, this is not at all intimidating and there’s plenty of room for all your friends.